The story of The Christmas Carol by Charles Dickens is by far one of the most epic stories of all time ever period forever. There is alot of self-discovery in hypocrisy everytime I watch any version of that story (even this one). But the new Disney show stunk, like a skunk, in a trunk, full of junk. The digital-ness of it was very unnatural and there were lots of scenes that felt like time fillers rather than moving the story forward. I was very dissappointed. My 2 favorite retellings of it are "The Muppets Christmas Carol" and "Scrooge" starring Albert Finney. Ill just stick to those 2 this year. The Albert Finney and Muppet version are my 2 favorite also. I was hoping this new one would be good. Guess I won't bother taking the time to see it! We go to a show every year put on by a theater in Ogden that is very good. 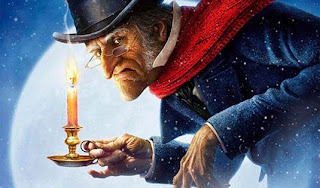 I think it is called "Scrooge" You should go see it, it is excellent and even the kids enjoyed it!